Is there a way for LiveHelpNow to push customer data such as Name, Email, Chat transcript, Offline message, etc. to my contact management system automatically, in realtime? No more manually calling an API, no more transfer delays, and no more frustrated developers. Eventing, which acts as a Streaming API, will allow you to receive fully customizable data and push it to any resource on the web at the exact moment a LiveHelpNow event such as a chat starting or a chat closing occurs. 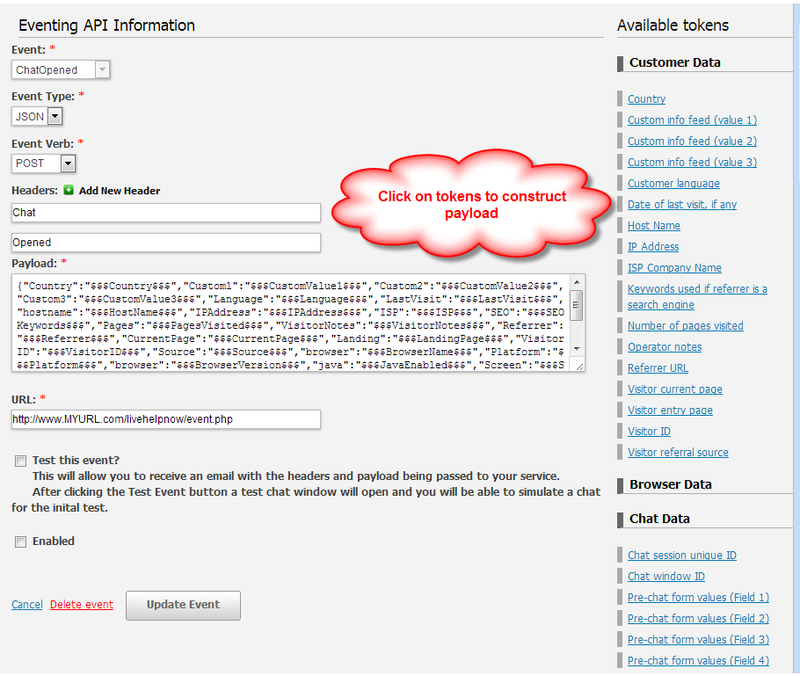 How does LiveHelpNow Eventing API work? When an event you have subscribed to, such as "Chat Opened", "Chat assigned", "Chat Closed", "Offline Message", etc. occurs for your account, a payload is constructed per your instructions with data formatted in the way you want and is sent to the resource on the web you have setup to receive the payload and process it. I'm excited! How do i set it up? Login to your account and go to Admin Panel->My account->Integrations and select "Events"
Select Event, Event Type, Verb, Headers (optional), Construct your payload by clicking on available tokens for the event. Provide URL to submit the data to. * We highly recommend to enable "Test" mode for the event and test the event first. While in test mode, the Event will email you the PayLoad so you can see whether the format is what you expected and then switch Event to live mode by unchecking "Test" mode and have the data sent to your "Live" URL for processing. How do i properly receive the data? Here's ASP.NET example showing reception of InputStream. Should you have any questions or concerns please do NOT hesitate to chat with us or submit a ticket for support, we are here to help!